Before I actually tried it, the idea of travelling overseas on my own made me anxious. I wasn’t concerned about being lonely. The few times I had travelled alone in my own country I’d loved the sense of freedom and time for reflection that it gave me. What I was worried about was dealing with people and situations in an unfamiliar environment without the safe buffer of travel companions. Getting sick without anyone to help me. Being the target of attention I didn’t want. It wasn’t that I thought I was especially incapable. It was more of a nebulous dread of not being able to handle the things that went wrong. When I found myself alone and overseas for the first time in Kuala Lumpur, I was rationally fine with it. I knew it was an incredibly safe city. But on my first trip out to eat on my own, I still felt full of uncertainty. I wanted to eat some street food but I didn’t really know the protocols, and I was convinced everyone would stare at me. I cruised through the Chinatown markets on high-alert, like I had been assigned some kind of special forces noodle-eating mission. When I eventually decided on a place, I couldn’t work out whether I was supposed to order first or sit down. These things seemed to sort themselves out so organically in the company of others, but on my own everything felt awkward. After some confusion, the women at the stall motioned for me to sit down at a bright red, miniature plastic table. I pointed to the dish I wanted. It was fried up and arrived on a hot-pink plastic plate. I ate it. It was tasty. Around me sat a couple, a man on his lunch-break, a family. People looked at me with mild interest, but nobody stared. Maybe this wouldn’t be so hard? It got easier, but I noticed that on my own, I behaved very differently. Gone was the relaxed, go-with-the-flow me. Without a fellow traveller to deliberate with, I often felt pressured to make decisions quickly, and not to stop and look or linger at a menu or a market stall unless I was already certain I wanted something. I would get flustered and end up eating somewhere I didn’t really want to out of guilt. I started googling where to eat before I left my hotel and using my phone to take me straight there, thus avoiding any deviation from my path of certainty. 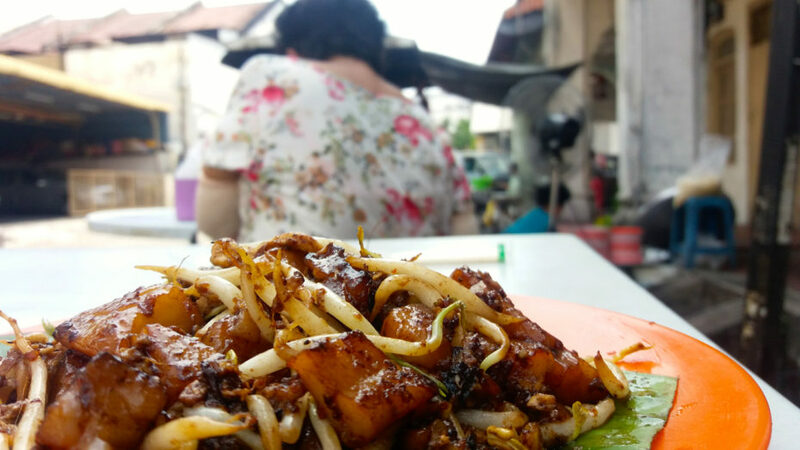 In Penang, I excitedly made long lists of recommended foodie spots, and each time I ate at a little street stall or in a hidden restaurant on my own I felt a joyous sense of personal victory. 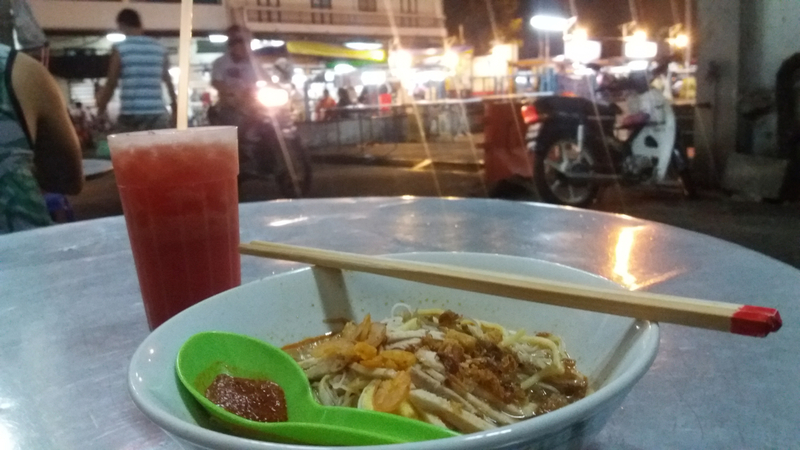 One night I ate my Assam Laksa under a narrow awning, separated cosily from the rest of the world by a veil of heavy tropical rain. At a coffee house, I ate toast with kaya (sweet coconut custard) and drank iced coffee, surrounded by hipsters with blue hair and avant-garde fringes. 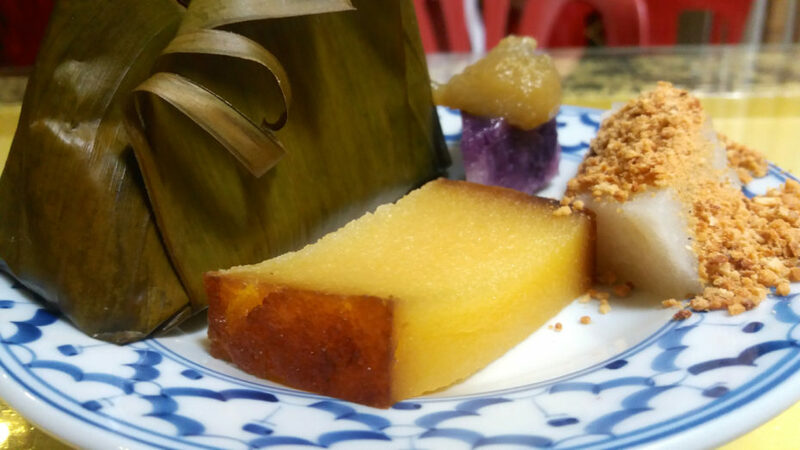 I visited a Baba-Nyonya (mixed Malaysian and Chinese heritage community) sweet shop and picked out a rainbow plate of raddish cakes and pandan coconut jellies from the counter to have with sweet, milky tea. But there were also times when eating alone was uncomfortable. Once a man at a roti house sat across from me and didn’t take his eyes off me, with a stare that seemed more aggressive than curious. I had no idea how to deal with it. In a country where you don’t know the rules, it’s hard to know what is worth making a big deal out of. Assertive glares and unimpressed eyebrow raises were ineffective. I just wanted to enjoy my unbelievably soft, buttery roti, but inside I seethed with rage. Another day I was having coffee at a sidewalk cafe, when a man noticed me, abruptly changed direction with a comic lack of subtlety and sat down at my table. Shocked, I responded with habitual politeness, explaining to him that I was really enjoying my coffee on my own. He smirked and leaned back self-assuredly in his seat, saying that he just wanted to have a drink with me and talk. The staff withdrew his menu when I explained I didn’t know him – but to my despair didn’t do anything to make him leave. I was clearly on my own. Forced to channel my rage out of my head and into the real world, I demanded he leave. Three times. With increasing forcefulness. And then he actually did leave. And even looked somewhat sheepish. I felt flustered, but I also felt a flood of victorious pride. This was exactly what I’d dreaded as a solo traveller, and it hadn’t been fun, but it hadn’t left me scarred for life either. Luckily, my solo-eating adventures were sometimes interesting for more benign reasons. One night, in Hanoi, I ate dinner at a restaurant in the old quarter. ‘Table for one?’ the young waitress asked me incredulously. When my food arrived she stood a couple of metres from me and watched me intently as I ate my meal. It was obviously motivated by innocent fascination, but it felt pretty awkward. I didn’t even know how to ask her to go away without sounding horrible, so I just smiled at her and submitted to eating my meal under her careful observation. I could deal with awkward. Afterwards she asked me whether I was travelling alone, and made sympathetic sounds when I confirmed that I was. But in amongst the pity was also some admiration – ‘You’re so brave!’ she marvelled. In truth, I was suddenly noticing how many women do travel alone. When you’re absorbed in the bubble of familiar company you tend not to take notice. Some of them will scoff if you tell them they’re brave, saying that it’s totally safe. I agree that it is very safe if you make sensible decisions (just as any traveller should, irrespective of gender). It’s incredibly frustrating when people argue that it’s risky, frivolous or reckless for women to travel alone. 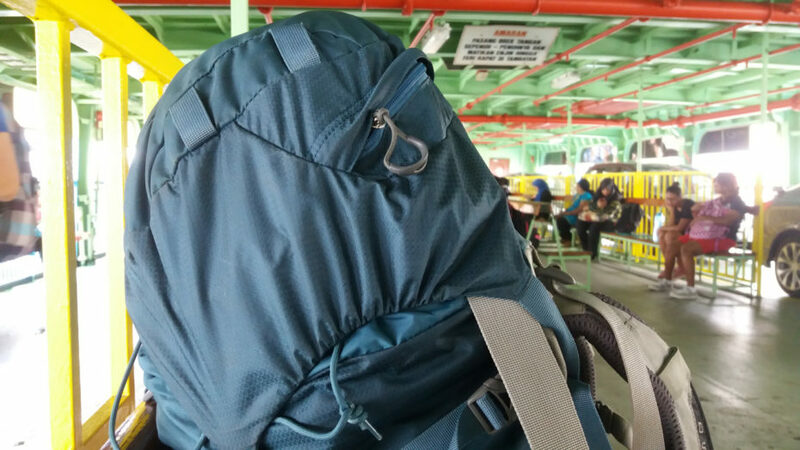 With my travelling companion on the ferry to Penang. At the same time, I would never dismiss the courage it takes for women to explore the world on their own. I think it is a very different experience that we have compared to solo male travellers. The idea that a solo woman is an invitation of some kind is still firmly embedded. Constant stares, smirks, unwanted comments and ‘compliments’ can become really tiring. Not exactly conducive to a fun and relaxing holiday. The world is still a long way from treating women as respected equals and we simply don’t have the same freedom that men have to travel unaccosted. Women do have to be more alert and careful, irrespective of what we wear or what we look like. Anytime you travel in a foreign environment, male or female, you’re likely to attract attention from locals, some positive and some negative. But the reality is that women are singled out for a disrespectful, objectifying kind of attention. I came to realise that when you travel with a man, or even another woman, you are often insulated and protected from these encounters. But everywhere in the world, and more frequently in certain places, there are men who seek out women on their own, women who they perceive as vulnerable. For me, travelling alone hasn’t always been ‘fun’ and ‘liberating’. I’ve felt uncertain of myself, out of place and at times, overwhelmed. But I now realise that my fears were disproportionate to the threats I actually faced (with the obvious caveat that I’ve travelled in relatively safe places and haven’t taken unnecessary risks). Though I have had negative experiences, these have never posed a danger to me. In spite of the very real drawbacks, travelling solo has been a revolution for me. I’ve found I am stronger than I knew. I’ve interacted with the world on my own behalf, without any mediator. Somehow, I’ve also started to trust strangers more, because I now have more trust in myself to deal with a situation if it doesn’t unfold well. Best of all, I’ve experienced moments that have felt vivid and uninsulated precisely because I was alone. Watching a village carnival light up the night from the window of my overnight train to Bangkok. Laughing and crying along with the rest of the audience at a Bollywood film in a cavernous old art-deco cinema in Kuala Lumpur. Walking back to my guesthouse in Vietnam’s Cuc Phuong National Park as fireflies began to dance in the still light of dusk. I now realise that eating alone, as daunting as it may have first seemed, was simply a threshold that I had to cross to experience all the more meaningful adventures and insights that come with travelling on your own. I’d recommend it to anyone. 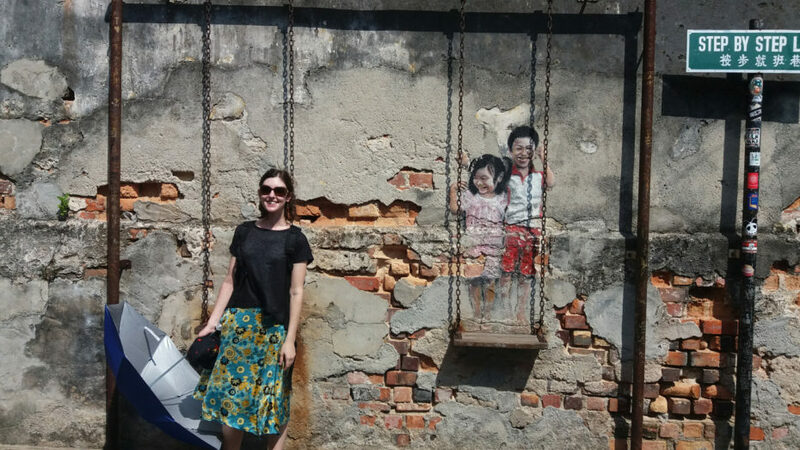 Exploring street art in Penang. Sometimes a selfie just won’t do.